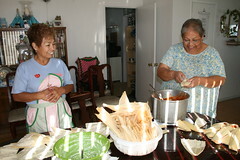 On November 8th at (I cant believe I got up this early on a saturday) 7AM, I met Grandma at Auntie Becky's to make tamales for Brian's homecoming. It was totally worth getting up. I got to hear some great, funny anecdotes about Great Grandma Reyes, learn all the secrets to the tamale making, and visit with my cousin Mikey who happened to be there for the weekend! 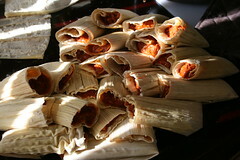 Some of the work was not so pleasant(separating the fat), and repetitive(spreading masa on each corn husk) but it was all worth it for the great tamales we got to eat in the end! Most importantly for the one-on-one time I got to share with my Aunt and my Grandma; I will never forget.